On December 25, 2015, the 4th Annual University Venture Grand Prix (UVGP 2015) was held at Tokyo University’s FUKUTAKE Learning Theatre. Hosted by Ministry of Economy, Trade and Industry (METI), among the 79 student groups who applied, nine teams were chosen as finalists to pitch to a panel of judges comprised of experienced entrepreneurs, professors, and industry leaders. 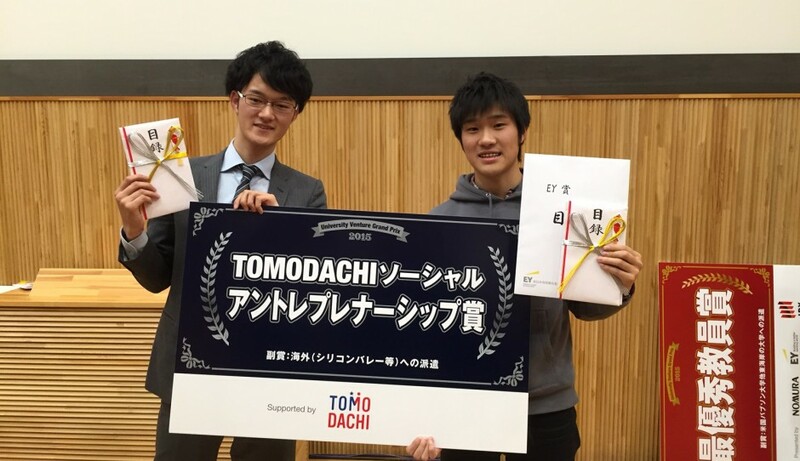 Two teams, Luciole.Inc and MoonGlass, received the TOMODACHI Social Entrepreneurship Award which is awarded to undergraduate and graduate students with the most innovative and creative business plans. These student entrepreneurs will travel to Silicon Valley in March 2016 to represent Japan and to pitch their ideas to American venture capitalists and meet with fellow student entrepreneurs and leaders in the industry. They will also receive intense training on pitching ideas and improving business plans. Educational model aimed at fostering subjective thinking by combining IT and Manufacturing in the classroom. Program focuses on young students with undergraduate female IT students as teachers. Production of eyewear “MoonGlass” that utilizes ISO sensor technology to transform night into daylight. Created to be a temporary solution for night blindness.